Red Velvet Cupcakes…Just in Time for the 4th of July! When the Cupcake Craze emerged, it resurrected the huge following of Red Velvet Cupcake goers. People just love them—and in fact, it’s my most requested cupcake. Traditionally dyed with beet juice, Red Velvet Cake has come along way and is produced in variety of incarnations. Some prefer oil to butter, cake flour to all-purpose, buttermilk to regular milk, a ton of cocoa powder to a few spoonfuls……it can go on and on. The particular version I gravitate towards uses a butter base in combination with sour cream. I find that this leaves the cake with a more rich and moist profile. I also love a deep intense color and tend to use more food coloring than others. This is also affected by the low amount of cocoa powder in this particular recipe. Whereas some prefer to use more cocoa powder, I am under the belief that it’s there just for a light flavoring. 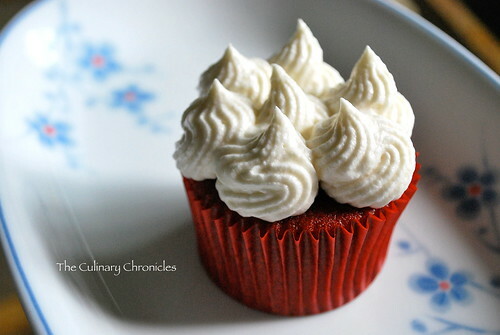 These classic Red Velvet Cuppies have been a fav among my family and friends. Top them off with a few blueberries and they will be the perfect addition to any 4th of July Celebration!!! In a separate bowl, sift together the flour, cocoa powder, baking soda, and salt. Set aside. In a standing mixer, beat butter and sugar until light and fluffy for about 3-4 minutes. Beat in eggs, one at a time. Add milk, sour cream, vanilla, and food color. Slowly incorporate dry ingredients until well blended. Fill each lined cup 2/3 full. Bake for approximately 18-20 minutes, rotating halfway between baking time. Cupcakes are done when a toothpick inserted in the center comes clean. Cool completely in pans on top of a wire rack. While cupcakes are baking, prepare the frosting. In an electric mixer fitted with the paddle attachment, cream together the cream cheese and butter until fluffy. Add vanilla extract and gradually add in the confectioners’ sugar, a few tablespoons at a time. Continue adding sugar to desire consistency. Refrigerate for at least 10 minutes before use. When cupcakes are thoroughly cooled either frost or pipe decorate swirls on top. 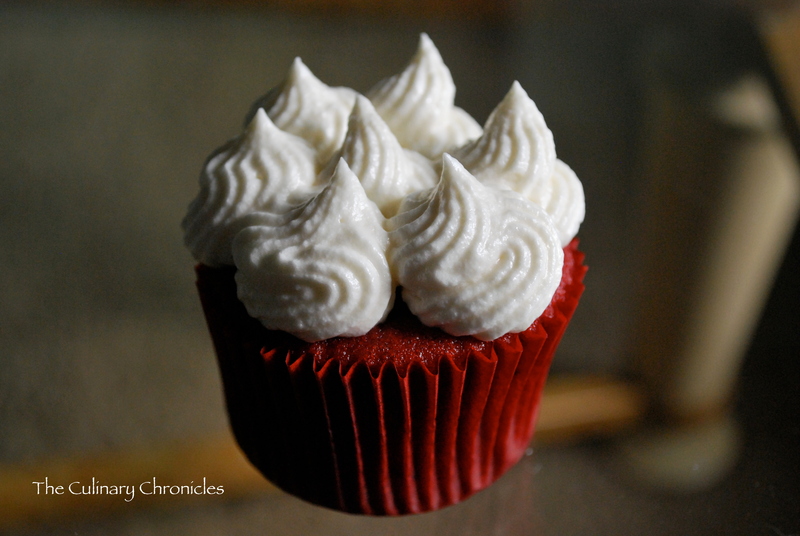 who doesn’t love cupcakes….your red velvet cupcakes look perfect, and I love that Icing! Thank you so much! Red Velvet Cupcakes seemed to brighten everyone’s day! Cheers!